Feeling of nostalgia in a simple taste. 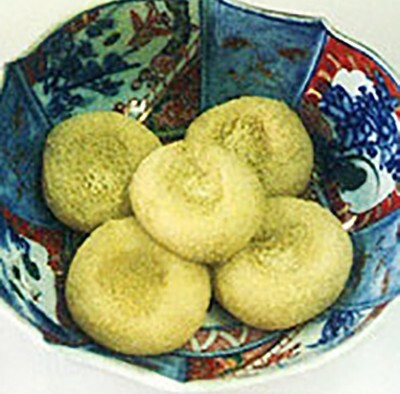 In a area where the harvest of rice was very low, people used kuzumai by making it into powder to make good use of any kind of rice. 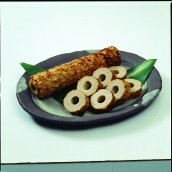 People tried to make kuzumai as tasty as possible, and mochigome and yomogi were often mixed with kuzumochi. 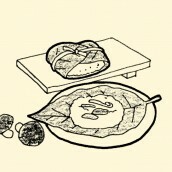 "Yomoginonoshidago" is one of the foods created in the process. 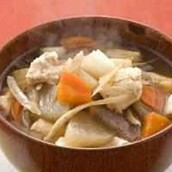 Put mochigome which was soaked in water over night into seiro, put the small pieces of dago on top of mochigome, and steam. 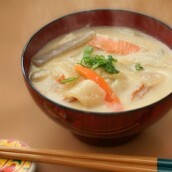 Once steamed, put them all into usu and boiled yomogi together, and pound. Roll out the steamed dago into 1.5cm thick, once it becomes firm enough to cut, cut it into 6.5cm square pieces.